Travel writers characteristics for success boil down to a common few, even though we're all different. Travel writers and travel bloggers come in many forms. Age doesn't appear to matter. I’ve met travel journalists as young as twenty-two and some older than seventy. Likewise, the travel genre we write about doesn’t really matter. Some writers specialize in food and wine, others write about spiritual travel destinations, and yet others describe their extreme adventures in remote places. Some writers cover places and events in their region, while others spend months trotting around the globe, seeking out places off the beaten path. Indeed, travel writing encompasses many things. 1. Successful travel writers take an active approach to travel. Travel writers are not tourists, although sometimes it seems like they’re one and the same. Tourists take a passive approach to travel. They purchase package tours where the hotels and sights are selected for them. They travel around in an air-conditioned coach with lots of other tourists. They’re herded around on guided group tours. The main attractions are presented in short sound bites. Traveling as a tourist is a comfortable, easy way to travel but so much is missed. It would be difficult to write a unique, compelling article if you always travel this way. Traveling as a writer is the opposite. It's active and engaging, and requires your full participation. I did a tour of a tank museum on an assignment in England. While tourists walked around by themselves and looked at the vehicles, I was assigned a guide who was the world's foremost expert on tanks. 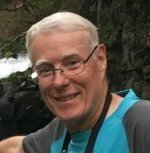 My guide had published several dozen books on tanks and several months later he was awarded the Order of the British Empire for his services. Although he didn’t normally lead tours, they made an exception because I was there as a travel writer. He answered all my detailed questions on the spot. And he even became part of my story. While on assignment exploring the Columbia River Gorge, I met a man selling honey at a roadside stand. I stopped and talked with him and he told me about his son’s beekeeping business. It was a fascinating story. I pitched the story idea to a magazine when I got home, and ended up writing a feature article about his son, the beekeeper. As a travel writer you need to find things that typical tourists won't find on their own. Try out the local transport, study your surroundings closely, and rub shoulders with the locals. Ask questions everywhere you go. You want to know more about the people you meet. You can’t just visit a destination. To write about it – and do a good job – you need to experience it. As a successful travel writer you’ll get to know your destination by peeling back the standard tourist attraction layer to get a deeper insight into the culture of the people and what makes them tick. Sure, you'll still visit the main attractions, but you’ll look closer, dig deeper and move beyond the obvious. 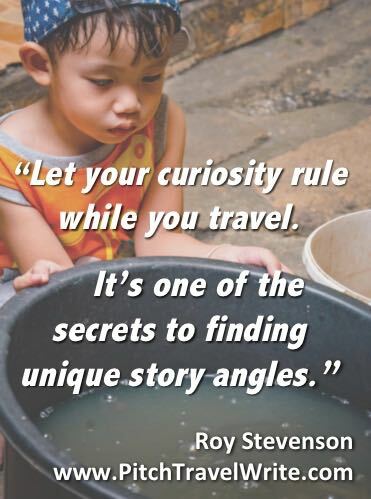 Let your curiosity rule while you travel to improve this travel writers characteristic. It’s one of my secrets for coming up with unique story angles and writing captivating articles. 2. 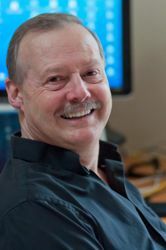 This travel writers characteristic includes well-developed social skills. As a travel writer you can’t feel shy about approaching strangers and asking them questions. In fact, you need to be sociable to draw people out and get them to talk about the place where they live. The people you meet can become characters in your story. It’s important to meet as many characters as possible while you’re traveling. If you don't feel you're doing well with this travel writers characteristic, brush up on your interviewing skills, fine-tune your listening skills, and always carry a notebook and camera to document what you’re seeing, hearing, tasting, smelling and feeling. Make these things habits and you'll improve. 3. A travel writers characteristic for success includes using all your senses. Good travel writing involves using all your senses when visiting a place. The photographs that accompany your article give a good sense for visuals. But without using your other senses it only provides one dimension for your article. But what about your other senses? How can you describe the sounds and smells in a bustling outdoor market in tropical Asia? What about tastes? Was that sweet, sour, salty, pungent, bitter, or does it defy description? Food, wine and beer writers need to pay particular attention to these skills because you want to make your readers salivate while they read your article. Use all your senses in your descriptions and your stories will become multi-dimensional and this travel writing characteristic will begin to shine. 4. A travel writers characteristic for success includes an active imagination. In order to succeed at travel writing you need to develop a knack for seeing a good story angle. Your story angle needs to be unique to get the attention of an editor and to captivate your readers. If you want to be paid for your articles, there’s a second aspect that’s important. You also need to think about media outlets and publications that might be interested in buying your story. In fact, these two steps go hand in hand – what’s your story angle and who will be interested in it? Successful travel writers know that one follows immediately after the other. As soon as I walked into the Western Antique Aeroplane and Automobile Museum (WAAAM) in Hood River, Oregon and saw the antique automobiles and historic aircraft, I knew that automobile and aviation magazines would be interested in this story. When I got home I put together a list of these magazines and fired off my queries. I sold articles about this museum to six print outlets. Another time I stopped in the Museum of the Black American Cowboy in Denver. At the museum I learned about a cowboy named Bass Reeves, a lawman who arrested more than 3000 desperados from the Badlands. I pitched this story to American Cowboy Magazine and they published it in their “Western Icons” section. When you’re writing your own blog, you don’t need to impress an editor, but you do need to keep your readers in mind. What you write needs to captivate them and motivate them to keep coming back for more. Either way, an active imagination will help you dream up unique story ideas and write articles that will charm editors and delight readers. This is a critical travel writers characteristic. 5. One travel writers characteristic for success is your willingness to share your opinions. Successful travel writers enjoy sharing their opinions about destinations, tourist attractions, hotels, restaurants, wines, beaches, and much more. We write about things that shock us, surprised us, upset us, and of course, the things we enjoyed the most. When you publish your writing you’re putting yourself out in front of an audience. You need to be comfortable doing this, because sharing your opinions also leaves you open to feedback of all sorts. It's a travel writers characteristic that makes you engaged with your readers. 6. Successful travel writers enjoy doing research. Successful travel writers don’t just show up – they do their research before they leave home. Constantly gathering information is part of the successful travel journalist’s standard operating procedure. Before you leave home you read travel guides, magazines, and do an internet search. 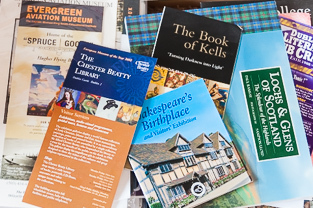 On the road you’ll write notes, collect business cards, tourist brochures and booklets. It’s important to do your research using multiple sources and to do a great deal of research in advance of your trip. This travel writers characteristic enables you to pitch articles before you leave home and travel “on assignment”. 7. This travel writers characteristic includes documenting your trip with photos. Successful travel writers need skills beyond knowing how to write. When you travel you also need to take copious photos of attractions and people. You do this for two reasons: 1) as reference information while you’re writing your story, and 2) to provide an editor with a gallery of photos to go with your articles. Check with your editor to find out if photos are required. These days most magazine editors assume you will provide a gallery of photos to accompany your story. Are you willing to learn how to market your story ideas? Successful print media travel writers are highly adept at producing an enticing and convincing query letter. This convinces an editor your story will be indispensable to their magazine. It doesn’t matter whether you're writing a short, front-of-book article, or a full-feature article, to be successful you must be willing to get out there and sell your stories. Selling your stories requires knowing how to create enticing query letters, and building up lists of magazine sales leads from online and print sources. This takes time and dedication, but once you have your list it only needs minor updating from time to time. 9. 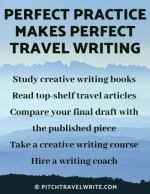 The most common travel writers characteristic is good writing skills. It should be obvious that above-average writing skills is critical. At the most basic level, this includes good grammar, perfect spelling and clean punctuation. Nothing turns an editor off more than query letters and articles riddled with basic writing errors. This career is all about putting pen to paper (metaphorically) and painting a picture for your readers. Conveying your sense of wonder to the reader is important. There’s nothing easy or romantic about travel writing. It’s work. If a reader says “your story made me want to go there”, or “your story really brought that place to life for me”, you'll know you've written a good piece. This is a fulfilling travel writers characteristic when you get this kind of feedback. 10. Desire to continuously hone your skills and develop your knowledge is a travel writers characteristic that can't be forgotten. Are you willing to continuously hone your writing? You’re constantly developing your travel writing “voice” or voices. You need to adapt your writing voice to fit each magazine you write for. Some magazines are casual, some are formal, and others are trendy. Your voice should change to match the style of the magazine. As you get more articles published you'll continue to improve your writing. If you’re publishing a blog your writing should also develop. How do you do this? With feedback. Seek feedback from spouses, friends and colleagues. Check your submitted manuscript against the published article to learn how the editor has changed your story. Seek opportunities to improve your writing through courses and peer reviews. Continuously look for ways to learn and develop. Are you disciplined enough to structure your schedule and sit down and work every day? If your objective is to get published in print media, are you able to ignore distractions such as social media, starting a blog, or other non-essential activities that keep you from your real work? Don’t procrastinate. Get out there and pitch some stories! Your real work is pitching and writing. Like any other career, travel writing is a job - especially if you’re a freelancer. Because there’s no boss looking over your shoulder, you must have the commitment and discipline to sit down every day and work. No one is there to help you succeed – it’s entirely up to you. You also need to keep track of who has purchased your articles, when they're due, and how much you’ll be paid. You need to review galleys immediately when editors send them because they expect a fast turnaround. Your research needs to be detail-oriented so you can write a good query letter and convince the editor you’re the right person to write the article. You’re always looking for interesting details to dangle in front of him or her. You need to be organized and detail-oriented to keep track of your photos and caption them correctly. The list goes on and on. So much of what writers do involves discipline, good organization and attention to detail. The above list only scratches the surface. Do you possess these traits? 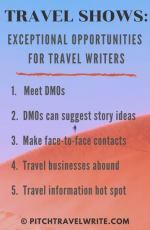 If not, you'll need to improve in these areas or you'll struggle with many travel writing tasks. 12. Every travel writer needs an unstoppable desire to succeed. Do you have an unstoppable desire to succeed? This is a highly competitive field. Successful travel writers stick with it even when they haven’t had an acceptance letter or an assignment for some time. If you write for print media you need a thick hide to handle the continuous stream of rejection letters. You need to be patient and persistent. When I started writing, I badly wanted to get an article published in World War II Magazine. I was patient and waited until the right story came along. Finally, after eight years I realized this dream with my article about Hitler’s West Wall, with a nice paycheck, too. So how did you do? Are there some characteristics where you are strong? Have you identified any areas where you need to do some work? Revisit this list once a year and keep tabs on how you’re doing. Capitalize on your strengths and work on other areas to continuously improve those things. You'll be surprised at the progress you'll make.